Bet you can't wait to get your hands on this 308 Win Match ammo from Magtech! These 50 rounds of ammunition are high quality and professional grade. Used by military and police, this ammo is sure to give you the personal protection you need and deserve. Each cartridge is loaded with a 168 grain match grade hollow point boat tail bullet. The HP-BT bullet combines the vast expansion of a hollow point with the aerodynamic boat tail, resulting in an extremely accurate, lethal blow to your target. These rounds are also lethal to paper, and will provide you with match winning accuracy for shooting competitions. 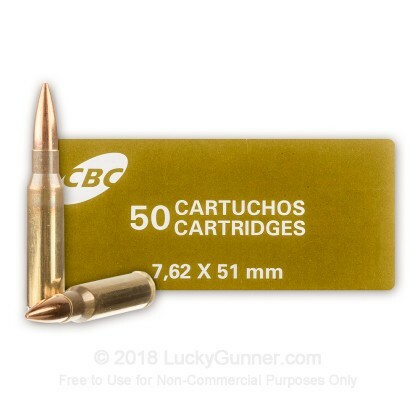 When you receive your 50 rounds of ammo, you will notice the brand name CBC on the box. That's because CBC is the parent company of Magtech. CBC Group consists of four international brand names: CBC, Magtech, MEN, and Sellier & Bellot. Magtech ammunition was established in 1990 and is produced in Brazil. You can trust that Magtech ammunition, as well as all other brands owned by CBC, will deliver consistent and dependable ammo for a great price. 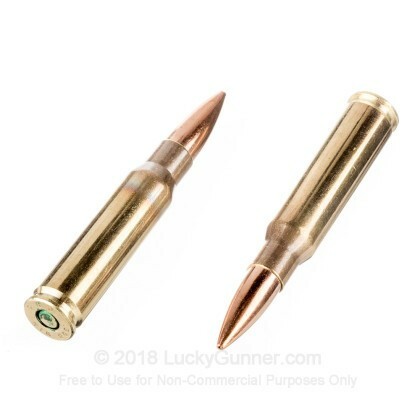 There are two criteria that I judge ammo by: Accuracy and Function. The Magtech was not as accurate in my rifle as Hornady Black. Almost identical performance to Fiocchi Exacta. My rifle is an older model so performance in the newer models may vary. (There was no real designation for my rifle when I bought it but it is very similar to the Patrol model. I will definitely be buying Magtech for range practice and will use it for hunting when the Hornady Black is not available. I shot a lot of different weights and types of ammo through my rifle and the Hornady Black came out on top. The Fiocchi Exacta was next. Did not have the Magtech at the time. Shot it later. My rifle did not shoot 150gr, 175gr, or 180gr accurately (one MOA or less). It only shoots 165 and 168 accurately. I bought a few boxes of this about a year ago and have shot it from 3 different rifles with no issues and more than adequate accuracy. I used it in a Ruger bolt action, M1A, and AR10. All functioned well and had good accuracy inherent to each different action. Sub MOA in many cases. Each shot was consistent in felt charge and accuracy. When I purchased this I heard some negative reviews (mostly from the M1A people but they tend to be overly sensitive and think all rounds should compare to a Match King) but gave them a chance anyway. I'm very pleased with the ammo and may buy again. Definitely more than adequate for the 200m range I use and most likely beyond. I've heard the brass is good to reload but I haven't done so yet with these cases. 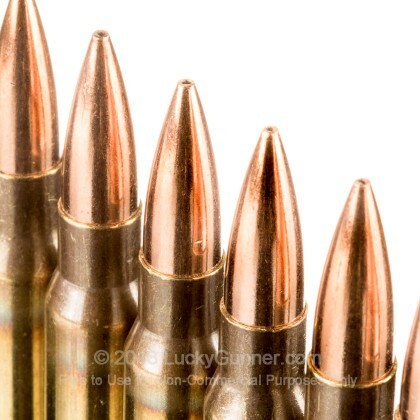 Not only is this ammo accurate round-to-round, but the brass is about the best quality 308 stuff I've ever re-loaded. Even if the price is a little higher initially, the brass easily makes up the difference! I recently bought a Tikka CTR in .308. As part of my getting to know the gun I brought together about 25 boxes of various loads to see what performed best. 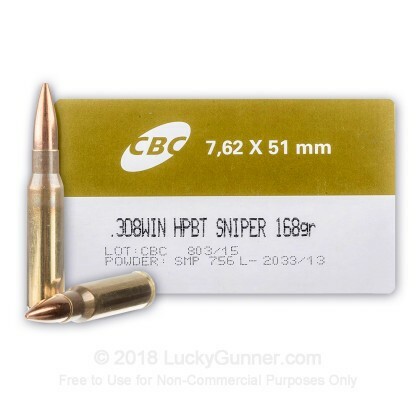 I found the CBC HPBT 168 gr sniper round to group nearly as well as the most expensive competition grade ammo. Three round groups consistently gave me 3/4 to 1" groups at 100 meters, this out of a factory rifle that cost me $1000. Great deal indeed. Time to find a range that lets me shoot out well past the 100 meters I'm limited to right now. So far I've had good performance from this ammo and plan on getting more. Out of my M1A and Ruger Gunsight Scout I have had 100% reliability with feeding, firing, and ejecting. The powder is fairly clean burning and the flash isn't terrible even from the shorter Ruger barrel. From what I've read this was produced from the military/government group of Magtech. All rounds performed very consistently and each round appears to be well assembled, and the casings are very well made and should reload very well. The grouping are about 1 MOA-ish. I've had better factory made ammo but also paid much more for it. 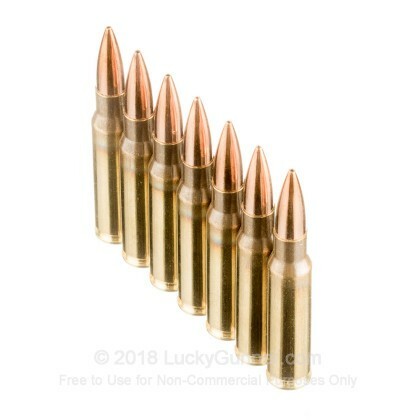 Unless your shooting in matches this ammo should serve well. A: The muzzle velocity is 2,635 ft/s.